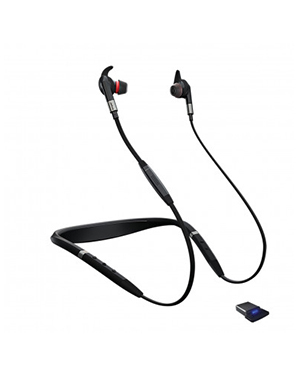 Jabra EVOLVE 75e & Link 370 MS Headset is an innovative and comfortable Bluetooth Active Noise Cancellation neckband headset that showcases some of the best features and functions of advanced audio and voice usability. Optimised for Lync, MS, and Skype for Business, this innovative headset is capable of blocking out noises that can improve a user’s focus and concentration. It also uses imperceptible static that helps in reducing environmental noise. Jabra EVOLVE 75e & Link 370 MS Headset is certified for StartMeeting, OnStream Mettings, Circuit, Adobe Connect, Join Me, ClickMeeting, Fuze, Chromebox, Google, Avaya, Cisco, and GoTo Meeting. Do you want to find out more information about it? Dial Australia wide 1300 131 133 right now! Jabra, headquartered in Ballerup, Copenhage, is a global enterprise that was founded in the year 1869 and specialises in several fields of expertise including Bluetooth, wireless and true wireless connectivity, speakerphones, headsets, headphones, enterprise audio requirements, sports headsets, and music and call headphones. Jabra operates under the banner of ‘Sound that’s engineered for you’, which basically promises unique, customised, and high audio quality to customers. Its sound solutions are incredibly innovative, which improves the audio experiences of customers all around the world. All products from the company deliver great music and unsurpassed call experience, which is able to improve the call handling and management skills of customers. Jabra products and solutions are used by customer to improve the concentration and collaboration of employees. Its enhanced features, including echo and noise cancellation technologies, can help in the directing employees’ focus on work while easy access to one-touch features like call answer and release can improve employee collaboration. Headsetsonline Pty Ltd is an Australia-owned and –operated enterprise that sprung as a new division under a popular and reliable headsets and headphones supplier in the market. Operating since the year 1998, the company is able to effectively deliver the audio needs of individuals, enterprises, and organisations by using a secured enterprise-encrypted website. The site uses the GeoTrust True Business UD with Extended Validation. Through the company’s secured site, customers can be rest assured that their online shopping experience in the company is protected. Headsetsonline also offers an extensive product portfolio with products covered by warranties accepted in Australia. Supplied by Australian distributors and not grey imports, the company’s products are all certified to pass Australian standards. This is how the company makes sure that all of its offers are of high quality and can provider irreplaceable audio experience. All of the ordered products are also delivered with flat shipping rates Australia wide.